The Apostle Andrew, son of Jonas, the Galilean fisherman and brother of Simon Peter, travelled as a missionary through the whole of Asiatic and European Scythia finally arriving in Achaia. He was arrested at Patras on the Gulf of Corinth and, by order of the Roman Consul, crucified being bound with ropes to a cross decussate (diagonal cross or saltire). Early in the fourth century, his remains were carried to Byzantium and honourably interred by order of the Emperor Constantine. During the same century and following the instructions he had received in a vision, the monk Regulus (St. Rule) set sail from Patras with the relics of Saint Andrew. He and his companions were shipwrecked off the east coast of Scotland and in fulfilment of his vision, he built a shrine on the spot where they landed at Kinrymont, placing the relics therein. While there may be some controversy between the traditionalists and the historians regarding the century of this occurrence, the fact remains that pilgrims devoutly visited St. Andrew's Shrine throughout the centuries. During her lifetime in the 11th century, Scotland's saintly Queen Margaret greatly encouraged such pilgrimages and not only instituted a free-passage ferry across the Firth of Forth (North and South Queensferry) to aid the pilgrims but also provided dwellings near to the shrine for their shelter. The site of the shrine eventually became the royal burgh of St. Andrews, known for its magnificent cathedral, which was founded in the twelfth century but, due to many adversities, was not finally completed until 1318 when it was consecrated in the presence of Robert the Bruce, four years after the Battle of Bannockburn. Today, only ruins remain of what was once one of Scotland's finest cathedrals and the relics of the Apostle Andrew have long vanished but thanks to its University, the oldest in Scotland, and the Royal & Ancient Golf Club, the town of St. Andrews still remains world-renowned. With reference to a second legend, which relates to the winning of a battle by Pictish and Scottish warriors against Athelstane of Northumbria's army, the following inscription on a simple memorial stone located in the quiet parish churchyard of Athelstaneford in East Lothian, Scotland describes the details: "Tradition says that near this place in times remote Pictish and Scottish warriors about to defeat an army of Northumbrian saw against a blue sky a great white cross like St. Andrew's and made in its image a banner which became the flag of Scotland. " It is related that on the eve of the battle, King Fergus of the Picts had a vision in which Saint Andrew told him to be of good courage and promised him a glorious victory. 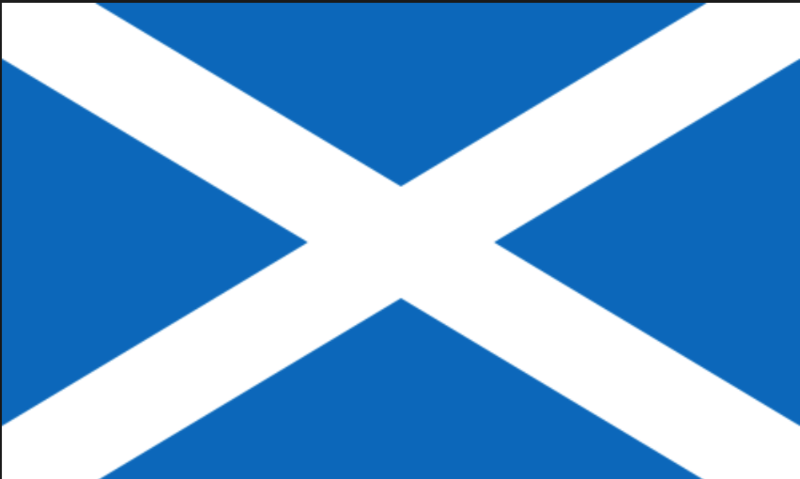 Thus, according to the legend, Saint Andrew became the patron saint of the Picts and later a united Scotland.